Galaxy FM's DJ Nimrod was celebrating his baby mama's birthday and this he did in style. The 28-year-old halted a performance by the B2C crew to sing a birthday song for his baby mama only identified as Brenda. Shortly after the birthday song, he called out Cindy to come and clear the space on allegations that he was dating her. Interestingly, he shot himself in the foot. "Of all the girls I have dated, she only fears you." Cindy, who was clad in a black commando fitting dress came to the front and hugged Brenda as a way of confirming that there was nothing going down between them, "We are just business partners," Nimrod added. 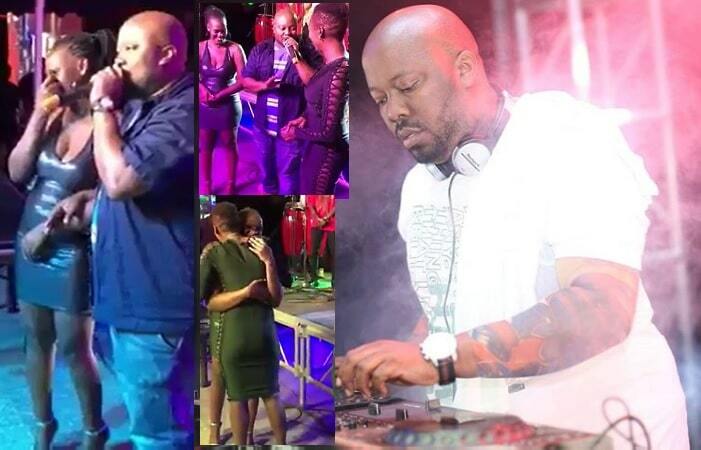 DJ Nimrod lost his ex-girlfriend, Natie Babe, to Radio Consultant, Joel Isabirye, who happens to be Rebecca Jingo's ex. DJ Nimrod's current lover, Brenda, has all the features that Natie Babe has, and, they resemble. One other interesting observation is that Brenda resembles Rebecca Jingo and when it comes to the behind, which seems to be Nimrod's most loved part, Brenda threatens to give Natie Babe a run for her money. You can as well say, Brenda was a perfect replacement of Natie Babe. Brenda and Nimrod have a child together, she fondly refers to him as Tata Milcah, and during the time of the recently concluded Nyege Nyege festival, she was complaining about leaving her behind just because she was taking care of the little one. The drama continues to follow DJ Nimrod. When the video of his new catch went viral, another baby mama of two came out all guns blazing. "I always laugh at those who regard him as a hubby and yet to me, he is just the father of my children who is determined to have all these city babes, and showing off..." more of that in the pic. Scroll down for video !! Video of DJ Nimrod singing the birthday song to Brenda and also inviting Cindy to come and clear the space on allegations that they were dating..